During last year, we convened 11 general meetings of the Southend TUC with an average attendance of 5 delegates. In addition, we maintained our affiliations to the Essex Association of Trades Councils (CATC) and the National Pensioners Convention (NPC). A special thank you is due to Des and Rachel Heemskerk, for the use of their home for our meetings throughout the year. In the run up to the TUC’s national March and Rally on Saturday 18th October, we held a successful street stall in Southend town centre on Saturday 4th October. We prepared and distributed a leaflet which advertised the national march and rally, and the coach from Southend organised by UNISON. There were expressions of interest from 14 people. On 18th October, 30 people travelled to London from Southend on the UNISON coach. Throughout 2014, we have supported the industrial action taken by colleagues in the Public Sector to defend jobs and services. We expressed our solidarity with: members of the PCS who took industrial action in June; and to the health unions and PCS, who took co-ordinated strike action in October. We have also supported the FBU in their current dispute over pensions. A donation was made to their hardship fund, for which the cheque was presented at the Southend Fire Station picket line on 6th December. At this year’s Leigh Folk Festival, we held a stall on both the Saturday and Sunday event. The Trades Unions are now recognised as the major sponsors of the annual festival, and our involvement is welcomed by the Organising Committee. For the fourth successive year, we have organised a mini-bus to the Burston March and rally. This year’s event commemorated the 100th anniversary of the setting up of the strike school by Annie and Tom Higdon. 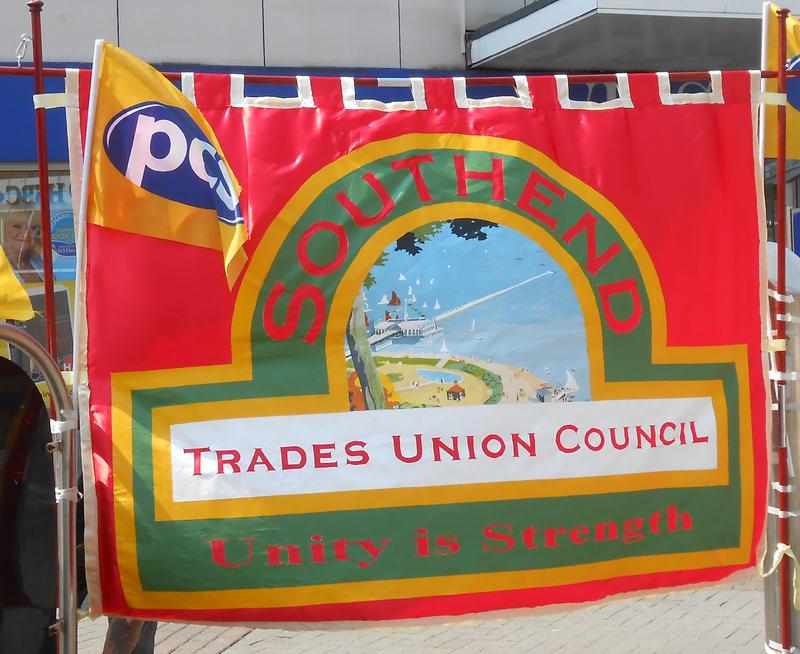 2014 has been another successful year, in which the Southend TUC has been able, by campaigning activities, to raise its profile both within the trade union movement locally and the community in which our members live and work.